great.. what screen is this? I have that one wallmounted with an AmazonBasics Arm, so I can change position in every way and have no rumble from the wheel on the Monitor. 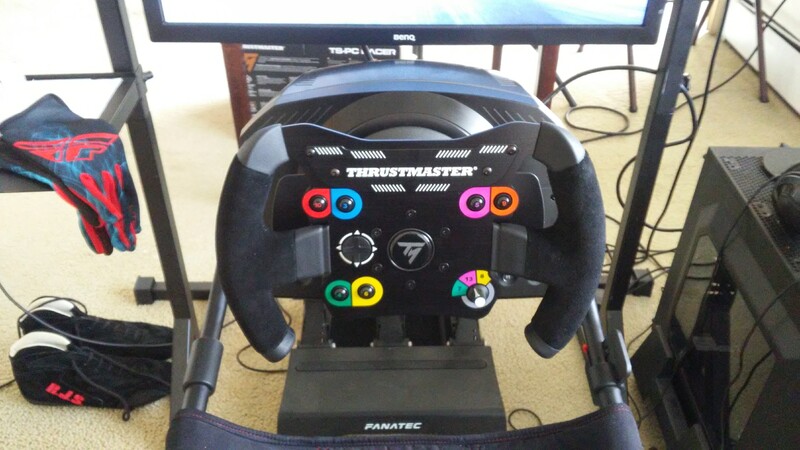 Upgraded from a DFGT that had for a decade, love the TS-PC Racer! That's a big step forward! Thanks, I still have my dfgt for future travel purposes. Way back I added the granturgismo paddle shifters and also stretched the brake spring for more pressure. She definately is/was reliable over the years. Seems, you've been victorious recently. 10 kg of additional weight. So is it the ghetto or the gangsta rig, racing boots, gloves n all? Pretty sure i know! My mistake, when i looked at your pictures it cycled thru 3, the third was Brians above, i just assumed it was yours as it was your pics i was looking at. But can you do endurance races without falling asleep? - Alu shifter knob for the HE SQ shifter. Nice, looks like a Ignition Button Box.. have one as well bit of a custom look now. Managed to move from my rickety desk to something more durable. Now I just need to save up the pennies and hopefully upgrade to nicer equipment to bolt to it. Sim Rig Status: 99% completed.